Read news published before February 2017 here. After a stellar 2018 season for both the 1st and 2nd XI’s Little Shelford Cricket Club (LSCC) is gearing up for what could be another very successful summer. After securing promotion on the final day of the 2018 season the 1st XI are hoping to cement themselves in Junior 1 South. The Cricket Club's strength last season lay in the depth of bowling options available, and with some further off-season recruitment the Club is again full to the brim with talented bowlers. Little Shelford will equally be hoping that the Club’s batting stalwarts can produce some stellar innings to keep them competitive in matches. Like the 1st XI, the LSCC 2nd XI were promoted last season, however due to league re-structuring the team find themselves in the same division in name (Junior 4 South), but a division that has been expanded in order to ensure competitive fixtures every week. The 2nd’s have also been bolstered this year by a mix of off-season recruitment and the fact that there are more players at he club of 1st XI standard then there are spots to be filled. As such the 2nd XI expects to be in the hunt for a second successive promotion. The Club’s 2 XI’s are expertly captained by Steven Hewer (1st XI) and Samuel Martensz (2nd XI) both of whom are ably assisted by Chris Schofield and Neil Orpwood. Interested in joining us as a player? Come and see us at a match or join us at our midweek sessions in the nets at the Wale Recreation ground on Wednesday nights at 6:30pm. The timings for the new bus service for Little Shelford which launched in December are changing. The shuttle bus to the Trumpington park and ride works on a "hail and ride" basis and operatese in the morning and afternoon peak times. The service originally ran every 20 minutes. But from March 25, it will run every 30 minutes instead. The price is £1 per trip. The route includes London Road, (Harston) Newton Road and Hauxton Road, (Little Shelford) and High Street and Church Road, Hauxton to the Trumpington Park and Ride. See the revised bus timetable here. For 5 days in May this year (20-24th), Ian Beaton from Little Shelford will be attempting the Berghaus Dragon’s Back Race. This is a fell run the equivalent of seven and a half marathons on wild and often pathless back country which follows the spine of Wales from north to south. The journey is 200 miles long with 10 miles of ascent across wild, trackless, remote and mountainous terrain. It is alleged to be the toughest 5-day mountain running race in the world. It is a linear course (for those in the know), without markings, but checkpoints and cutoff times enroute, with a maximum time allowed in the mountains every day of 17 hours. Any more, and you do not get to continue the next day. Traditionally 50% of entrants manage to finish the course, given the demands on the body, the likelihood of getting lost/missing checkpoints and the day to day grind. This is the 5th time the event has ever been run, first being attempted in 1992. The route starts in Conwy in North Wales and crosses all the Welsh 3000 ft peaks in the first day, including the Carneddau, the Glyders, Tryfan and the Snowdon horseshoe via Crib Goch. Day 2 carries on south into the rarely visited Moelwynion and Rhinog mountains, which are beautiful, remote, and lacking in that vital component that fell runners love, namely paths. The running underfoot is as unpleasant as the scenery is rewarding. Day 3 takes on Cadair Idris in southern Snowdonia across the whole of the ridge from east to west before turning south once more to the Tarrens, and over Pumlumon Fawr, source of both the rivers Severn and Trent. It also passes through a town, Machynlleth, which will be subject to a horde of ravenous runners descending on its supermarket to ransack it of any foodstuffs available. Day 4, alongside Day 3, is the longest horizontal distance at 71km each day. However, Day 4, if Ian is still running, has the beauty of being the first day that the vertical ascent dips down below 10,000 feet. This day takes in the Elan Valley and its famous ‘moon grass’ tussocks and bogs to twist and soak the unwary. Day 5 is a relative trifle, with a mere 63km to run (one and a half marathons) and 2200m of vertical. It also has a few miles of road to run on at the end, which should make a change from the rock and bog of previous days. So, something to look forward to then. The race ends in Llandeilo. Ian will be sleeping well (he hopes), and eating like a horse during this period. The campsites will have lots of cold stream water in which to wash, apart from Day 2, which is actually in a real campsite and is purported to provide hot showers. Ian expects to be running/crawling/crying for a substantial amount of his waking hours each day. There is an email system (‘Dragonmail’, details on website below), whereby he will be able to receive words of wisdom, advice and encouragement each evening. Failing that, good old fashioned, motivational abuse will also be gladly received. There was a record turnout for the Village spring clean on March 3. The haul included four tyres and a microwave. Thanks to the record number of volunteers who turned out on the wet afternoon. The Little Shelford Safari Supper is back on this year and will happen on Saturday 11th May. It’s a night to meet people new to the village and see old friends, travel around for each course and get fed in the process. The evening will start with drinks together, then main courses and desserts in small groups before reconvening at the end of the evening, Everyone contributes in some way, and there are plenty of things to do for those who can’t host. No need to come as a couple, and dietary issues can be dealt with if known in advance. Please do get in touch with Kate Beaton (katebeaton@me.com) to find out more and register interest. The Parish Council’s share of the Council tax bills will not increase in April. The Council has agreed to maintain its spending to £29,000. Bridget Sumsion has joined the Parish Council. Read her profile here. The Parish Council is to complain to South Cambridgeshire Council again about road gutters not being swept. The situation became so bad recently that some parents took matters into their own hands by clearing leaves in Bridge Lane. The Parish Council has agreed to buy a new picnic table for the Rec after the last one was destroyed by fire. A Manager from the County Council’s highways team has been invited to the Parish Council meeting in March when the poor state of the High Street road surface will be flagged up. The lighting on the track on the Wale Recreation Ground has been completed. The Parish Council has agreed to pay £200 towards the Rec been rolled to try to reduce the number of chaffer grubs. A villager who has painted white line outside their home in the High Street to prevent parking has been reported to South Cambs Council. A village spring clean is taking place on March 3 starting at the Memorial Hall at 2pm. Volunteers are welcome. The SSYI big breakfast is taking place on March 23. You can see the full minutes from the Parish Council meeting when they are published here. Thirty people attended the first monthly afternoon tea party in the Pavilion. Since the village survey last year asking what things you might like to see happening in Little Shelford, progress has been made in several areas. Judy Boothroyd led a group of enthusiasts to organise a monthly after tea party. This will be between the monthly coffee mornings already well established in the North Building next to All Saints. More than 30 people enjoyed the first session. Some brought some craft work for a ‘knit and natter’ too! Get the next three dates in your diary: 13 February, 13 March, 10 April. Contacts for lifts would be Susu Scott (841998), Judy Boothroyd (843313), Christine Ruffles (844243), Glenise Turner (840034). This class is now established, but would welcome new members. Contact Vikki Green victoriagreen@btinternet.com or 07762902976 for more information. The first of the classes being run by Michelle McKay is on Friday mornings at 11am in Little Shelford Memorial Hall and will run weekly. The second will be on a Sunday Evening at 18.00, which will be slow and focus on relaxation. The Sunday class will be monthly beginning on the 3rd February. Bookings will be necessary and can be made by contacting Michelle at michelle@honourourbody.co.uk or on 07753 606691. New bus service for Little Shelford. A new bus service for Little Shelford launched at the end of December. The shuttle bus was due to start on 31 December 2018 in addition to the existing bus services. It works on a "hail and ride" basis and will operate in the morning and afternoon peak times. The 32 service is operated by A2B. On Saturday, January 26th at 7pm, there will be food and a film (both focused on Yemen, details to follow) in Little Shelford Village Hall to raise funds for the children affected by the world’s worst famine in a century. Almost every child in Yemen (some 11 million) is in need of aid, and the recent opening of some ports means that, at last, there is some hope of getting it to the most desperate.We hope that many of you will be able to join us, but even if you can’t, donations can be made at any time to those selling tickets. All money raised will be distributed through Tear Fund, an organisation with a solid delivery capacity in Yemen. Tickets are available from Caroline and Charles Kingdon (kingdon.caroline@gmail.com, 842048). There is also an opportunity to donate to an auction to take place that evening - recycle those unwanted Christmas gifts or offer an auction promise. We already have an promise of a day’s gardening and a day’s care for an elderly or unwell person. The book Secret Cambridge by Andrew Sargent includes photos by Will Conway-Smith from Courtyards (including the picture on the right). "I wanted anyone who has a car with keyless entry &/ or start to be aware of relay thefts. This is where they use an amplifier to amplify the signal from your key if its close to the door/ window etc & can then open your car & start it. "I was woken up at 5.15am by the dogs going mad & found my car unlocked & drivers door open. Thankfully its electric so was also plugged into the charger meaning an extra step anyone would have to take before they can drive off. "You can prevent this by putting your keys in a metal tin, the microwave or there are specific RFID pouches you can buy too. I believe one or 2 insurance companies have started sending out RFID pouches to policy holders." A house in Courtyards was burgled on November 9. Cameras, silver, jewellery and money were stolen. The burglar spent an hour in the house turning it upside down. The Navigator pub in Little Shelford has had a facelift. The Shelford Feast has launched a questionnaire to see how they can improve what they offer. The deadline for responses as 23rd December. As an incentive they are giving away a pair of Weekly Tickets worth £100. They will draw and announce the winner on 24th December - an exciting early Christmas present for someone! The PC welcomed Hugh Baynes as the new Tree Warden. He has volunteered to log and monitor all trees on LSPC land. He is also interested in encouraging wildflowers on the verges. David Munro has resigned as a Parish Councillor. The Council has co-opted Bridget Sumsion for one of two vacant seats. The Parish Council has agreed to spend £5,995 on lighting for the track to the sports pavilion. It was confirmed that no planning permission is needed for a height restriction barrier. After some regret councillors have decided to go ahead with a barrier. The picnic table on the Wale has been vandalised beyond repair. The speed camera data has been shared with the police showing the speeding problems on Newton Rd in particular. They say they require data over a longer period but in the meantime suggested starting Speed watch scheme. It was decided to collect more data and then approach Local Highways for a solution. Fallen trees on Bradmere loop. Parish Council thanked Guy Belcher and Hugh Baynes and all the volunteers who cleared the trees. c) A picnic table by the pond has graffiti on it. Clerk to ask for volunteers to sand & repaint it. David Jones thanked All Saints Church and the History Society for the events held over Remembrance weekend. He noted there is a war grave headstone that needs additional care and possibly relocating inside the church. A new strength & balance class has started in Little Shelford. A monthly Afternoon Tea session is being launched as part of the Little Shelford Good Neighbours project. The sessions could include singing and/or board games. starting on 9 January and then on 13 February, 13 March and April 10. To commemorate the 100th anniversary of the end of World War One, the History Society has made a contribution to the Royal British Legion for a number of large poppies which will be attached to lamp posts around the village. This is to remember the 13 men from Little Shelford who gave their lives fighting for king and country. Below are the names recorded on the memorials in All Saints Church and Little Shelford Memorial Hall. You are probably aware of a smart, new wooden seat on the recreation ground inscribed with ’In loving memory of Tony Rignall 1930-2017’. Tony grew up in Little Shelford and played cricket here in the 1950/60s before moving away. He loved this village and his wish was to have a seat placed on the recreation ground, overlooking the cricket square. His great cricketing friend Bryan Nunn, who also lived in Little Shelford as a young man, organised the arrangements for the seat with the Parish Council’s approval. This year the Cricket Club celebrated one of its most successful seasons, with both teams finishing second in their respective divisions and consequently gaining automatic promotion. A celebration dinner was held in the village hall and was enjoyed by players, their wives and partners and Vice Presidents. Preparations are under way for next season - the square has been scarified and re-seeded and nets booked at Hills Road Sports Centre from November onwards. Is your your charity looking for funds or prepared to be involved? If you know a local charity or organisation that might benefit by receiving funds from the Sawston Fun Run, let them know. They are inviting local charities and organisations to apply to be a beneficiary of the event to be held on Sunday 12th May 2019. Each year, the event, donates £12,000 to £15,000 to charities and organisations serving villages in this area. Since 1986 they have raised more than £455,000 for local hospitals, hospices, schools, youth groups, support groups and local branches of national charities. You need to identify a specific project or activity that needs support, tell them who will benefit, and say when the funds are needed. Whilst capital projects are preferred, the selection is based on the strength of each case. The closing date for applications is 30th November. Application forms are available off the website www.sawstonfunrun.co.uk or by contacting the phone or email below. This great local event has expanded over the years so it engages with all sections of the community and attracts around 1,000 entrants. It is organised and managed totally by volunteers with support from local businesses and retailers. Past sponsors and advertisers are already confirming their backing. We would love to hear from any business or individual who is willing to help or be involved in any way. A new yoga class is starting in Little Shelford on Mondays from 22nd October, 7-8.15pm at the Little Shelford Sports Pavilion. Small group (maximum 8 participants), mixed level Ashtanga Yoga classes, suitable for beginners as well as those with some experience. Ashtanga Yoga is a dynamic style of yoga based on a set sequence of postures linked by breath. It is highly effective for building strength and flexibility while cultivating a calm, focused mind. The first results have been published from the Little Shelford speed cameras. The data shows Newton Road and Whittlesford Road are both seeing a significant number of cars exceeding the 30mph speed limit. One car was travelling at more than 60mph in the 30mph zone in Newton Road. More than 20% of the cars in Newton Road were speeding according to the data. In Whittlesford Road, around 10% of vehicles were exceeding the 30mph speed limit. The Parish Council is sharing the speeding date with the police. The Council is also collecting data for the next 12 months before deciding on an action plan. See the full results of the speed camera data here. A number of events are being planned by All Saints Little Shelford to commemorate the end of the Great War 100 years ago and the signing of the Armistice and to say thank you to those in the village and more widely who served, sacrificed and changed our world. Sunday 11th November 10.30am All Saints Church. A special service of remembrance with choir. Including a display of information about the impact of the Great War on Little Shelford and the lives of those lost and commemorated on our War Memorials. “Ringing Remembers” at All Saints Our Bell ringing team will be ringing a number of special peals in commemoration of the end of the war as a contribution to the “Ringing Remembers” campaign. More details of all the events will follow but please note these dates in your diary. Joan Atkins, who was 98 last July, has died. She lived in Little Shelford for over 50 years after coming home from Botswana with her husband. While there she was awarded an MBE. Joan and Dennis lived in Church Street and then moved to Courtyards. She became very infirm, although mentally sharp. and moved to a Nursing home in Cheltenham, near one of her daughters, over a year ago. Her funeral will be in Cheltenham on15 October @ noon. New yoga classes could be launched in Little Shelford. Rachel McCarthy runs a Tuesday evening (6.30pm) Mixed-level Ashtanga Yoga class at Little Shelford Sports Pavilion. It’s a small group class - max 8 participants - which is fully booked to the end of September. But a couple of spaces may become available in October depending on whether any current participants do not continue. She is considering adding a daytime class, perhaps on a Wednesday or Thursday lunchtime, and/or extending her Tuesday evening class to allow for 2 groups. Please get in touch with Rachel at rachelmccarthy@outlook.com if you are interested in the classes. 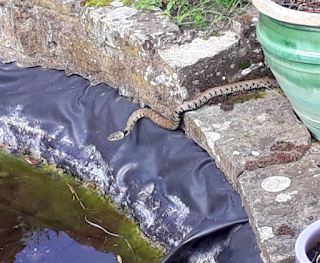 A home in Little Shelford has had grass snakes in their garden over the summer. 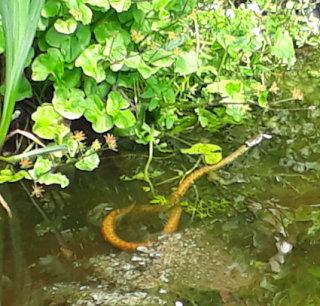 David Wilding, who lives off the High Street ,has had snakes in his pond most years for the last five years. They appear in spring and seem to feed on frog spawn and small frogs. "I am not sure what happened to them," said David. "They often fall foul of cats and other predators. The snakes do not really bite, unless you are a frog. 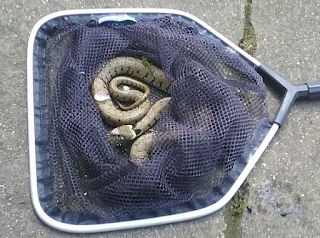 We saw one battle between a pair, which I had to resolve with the fish net, I let them both go. If they are cornered they can defend themselves, but typically they hide away." The Green Groups in the Shelfords, Stapleford and Sawston are looking for volunteers to join from Little Shelford. "We would very much like to have a representative from Little Shelford at our meetings; there are a few on our newsletter distribution list, but no-one active, which is a shame," said Convenor Linda Whitebread. An additional qualified Girlguiding leader, or someone who is willing to undertake the Girlguiding Leadership Qualification, is urgently needed to share the running of Shelford and Stapleford Rainbows from September. This would involve sharing the planning and resourcing of activities and running of meetings with the current leader. Rainbows is the youngest section of Girlguiding and is for girls aged 5–7 years. The unit meets once weekly during term time. To find out more, please contact Lisa MacGregor, Shelford District Administrator (lisa.macgregor@ntlworld.com) and visit www.girlguiding.org.uk (search for Rainbows and Leadership Qualification). The new playground is due to be completed by the Fun Weekend on September 7. The Playground has been supported by donations from Amey Cespa and WREN. Please do not hesitate to contact me if you have any concerns or queries. A house in Hauxton Road, Little Shelford was broken into between midnight on May 26 and midnight on May 29. Burglars forced the lock on a side door to get into the house before stealing a quantity of jewellery. An Celtic woad grinder up to 2,000 years old has been found near Little Shelford. The 7cm item is believed to be made of bronze. A blue dye was obtained from Woad leaves which were ground down with grinders like the one found near Little Shelford. The dye was used by the Celts to paint their bodies and frighten their enemies. The find has been reported on Metal Detecting Forum. The find was made by someone identified only as Kranglemeister. A new bus service linking Little Shelford with the Trumpington park and ride will be launched later this year. The service will travel along Hauxton Road and Newton Road in Little Shelford. It is likely to operate every 20 minutes at peak times of the day. There are also plans for it to run at weekends. The bus service is being subsidised for 10 years by Redrow, the new developers of the new homes at Hauxton Meadows. The service It is expected to start in September. The theme for this year's village week-end is Eurovision. They are very excited to be holding our first Fun Village Show and all entries are free. Please fill in the entry form included below. Entry Forms must be brought to 71 High Street, Little Shelford on Thursday the 6th September between 3 and 7.30 pm. Exhibitors will receive an entry card for each item that they are entering, and these must be brought with each item on Saturday morning. Exhibits must be brought to the marquee on Little Shelford Rec on Saturday the 8th of September between 9.30am and 10.30am, no items can be accepted after 10.30am as judging will have commenced. Judging will take place from 10.30am to 1pm. Two deer heads have be found by walkers down Bradmere Lane. One was found around half way down the track. The other was found near the pond. "They were the top part of the head, mandible cleanly removed, and otherwise in perfect condition and fresh," said Christine Davey who found one of the heads while walking her dog. "I’ve spoken to someone who shoots and he tells me this is not any part of the procedure for processing a deer." The heads were found a couple of months ago. Fortunately none have been found since then. The Liberal Democrats won the two South Cambridgeshire District Council seats for the Shelford and Stapleford on May 3. The seats had previously been held by the Conservatives. There were no Parish Council elections on May 3 in Great Shelford, Little Shelford and Stapleford as there weren't enough candidates who put their names forward. * The proposed changes to the junction of the Church Street/ Whittlesford Road junction will not now go ahead despite significant support in the village. The County Council decided that the scheme is not in their top 10 priorities for funding. * The Annual Village Meeting will take place on April 26. Read about the decisions and actions from the March Parish Council meeting. The Little Shelford Playground Action Group are delighted to announce that they have reached our target for the renovation of the new playground at the Wale Recreation Ground of £84,000. Work on the new playground will start this summer. The successful campaign has been achieved through grants, donations and fundraising activities. A huge thank you to everyone who has been involved throughout the process. The next step is to choose our contractor and we will shortly be meeting with HAGS SMP and Kompan to discuss their final plans, with the intention of making a final decision at the Parish Council meeting on March 19th. Thirteen of your fellow villagers met for the first time on 20 March to think about what might be possible and useful to offer to villagers in need of a little help – wherever we are in life. what might actually be wanted and used and what people might be able to support with a little of their time. If you are interested in joining the group or if you could just spare an hour or two to help distribute the survey, please contact Richard Patterson, 7 Garden Fields, 07903 359 699, richard.patterson@mottmac.com. We will need all the help we can get. A campaign against the proposed new Park & Ride at Hauxton will be kicked off at the next meeting of the Harston Residents' Group on Tuesday 20 March at 8pm in the pavilion on the recreation ground off The Limes. Have you reported a pot hole? A driver is trying to track down villagers who might have reported an ankle deep pothole on the High Street. Janet Goodyear was driving on the High Street on January 20 when she damaged her car wheel in one of the pot holes. A report and claim were immediately made to Cambs County Council. The claim was rejected as it was claimed that the Council were not previously aware of a highway defect. "I am appealing this decision not least because I can see myself on the CCC reporting map that the highway defect was reported previously I don't know who by," said Peter Goodyear. "The extreme profile of the pothole was such that I think it likely that there may have been other reports prior to our incident. There have been 2 reports since from other parties resulting in tyre damage. " Please get in touch with the website if you think you can help Peter. PCSO Chris Wiseman attended the meeting after several complaints about poor parking in Little Shelford. He asked people to ring 101 and report the cars if they are blocking the pavement or parked too close to a junction. The Parish Council has agreed to spend up to £8,000 on lighting for the track leading to the Sports Pavilion. The style and number of the lights has now to be agreed with South Cambridgeshire Council. The Council is increasing its share of the Council Tax bills by just under 2%. The budget will increase from £28,000 to £29,000, providing extra money for possible junction changes and tree work at the Rec. Proposals to change the priority for traffic at the junction of Church Street, Whittlesford Road and Bridge Lane are being pitched to the county council in May. Speed sign updates for the village are now expected to be installed in the spring. A village spring clean will take place on the afternoon of February 25, organised by David Jones. The tidy up will start at 2pm, while there will be a chance to meet your parish councillors from 4pm. The park and ride at Trumpington might be moved to a site at Hauxton near the M11 junction. The Parish Council is concerned about the possible changes and their impact on Little Shelford. There will be a briefing for all villagers at the next Parish Council meeting on March 19th. There are Parish Council elections on May 3. Mrs Evans is re-locating to be near her family, including her three grandsons, two of whom have been born in the last few months. "Being five hours away from them is too far to be able to see them regularly enough," she said in a letter to parents at the school. Ther head teacher will leave the school at the end of the summer term. Mrs Mitchell will be leaving at Easter, due to her husband’s job relocation to Harrogate. Mr Paduano and Mrs Jenkins are leaving full-time teaching at the end of the school year for a healthier work-life balance. A six-week public consultation has begun on proposed modifications to the draft Local Plans for South Cambridgeshire. A new policy to say we will begin to review the Local Plans in 2019 with a view to preparing a joint Local Plan for both Cambridge and South Cambridgeshire. This was a commitment the two councils had already made as part of the Greater Cambridge Partnership agreement with Government . The Office of the Police and Crime Commissioner has launched a consultation regarding the police precept. They would welcome your opinion. The consultation will be running until January 29th. Little Shelford's former police officer Gary Kendall has launched a new gardening service. Gary was Little Shelford's Police Community Support Officer (PCSO). Now he has started a gardening service with his partner Sam (Pictured left). Their services include lawn cutting, hedge trimming, fence painting, weeding, patio cleaning and general garden clearance. "I was the PCSO for 10 years in the Shelfords and Stapleford area, but I have always loved gardening," said Gary. "So when I decided to move on from the police service, it is great to be able to do something everyday that I love so much, and to be able to help people with a good honest and reliable service. "Sam and me already have satisfied customers in the area, and manage an estate in Thriplow." Gary can be contacted on 07598307035. There has been a distraction burglary in Hauxton Road, Little Shelford. The incident happened on November 13 around 12.30pm. The householder discovered a man in their home who claimed to be from the waterboard. The male spent some time distracting the householder while two further men searched upstairs. The male was described as white 21-40ys, 5"8 - 5"10, with short curly brown hair. The householder became suspicious and called for help in the street. The men then left the property. Always make sure you have secured any back or side doors before you answer the door to callers. The 'waterboard' does not exist so be suspicious of any caller mentioning this, it will typically be Cambridge Water or Anglian Water in this area. Use a side window, or spy-hole to check callers identity before letting them in. Genuine tradespeople or utility workers will not mind waiting while you make some checks. Many utility companies will offer customers passwords so they can be re-assured the employee is genuine. Always use the contact number on your bill, not a number given to you by a caller.Call 999 if you are suspicious. Not Sure? Don't Open the Door. Shelford Medical Practice could merge with the larger Granta Group in 2018. The move would ensure the future sustainability of the Medical Practice in Great Shelford. 4) Management services would be shared between the different members of the group. The Granta Group currently has 3 practices operating from four different sites, including Sawston. A consultation about any changes is expected to happen in early 2018. Read a statement from the Shelford Medical Practice. * The Shelford Medical Practice, which has 9,000 patients, is also considering options around a new medical practice building for the Shelfords and Stapleford. I am delighted to report that the recent User survey received 404 responses, which is a quite exceptional response rate. Thank you to everyone who took the time and trouble to respond. In this short article I don’t have space to give the full results but these will be available at our AGM at the Library on 30thJanuary 2018. As expected most respondents came from (in order) Great Shelford, Stapleford, Harston, Little Shelford, Trumpington, Whittlesford, and Hauxton but also from 11 other villages and from Cambridge. Most comments were hugely enthusiastic about the Library – for example, when asked to state how much they valued the library the average score was 9.35/10. This is a powerful level of support for the library as it is and for having a professional librarian, with much praise for Rosemary. Contrary to many people’s opinion of Great Shelford, the largest group of respondents were in the 31-65 age bracket, and not the over 65’s! A number of respondents asked that the library provide more activities for children and adults. The Friends Committee is actively discussing this with Councillors and the Library Service to see how we can make this happen. At a time when we are facing an uncertain future (how many times I have said that!) it is very reassuring to see that from our survey over 80% of respondents were prepared to pay something extra towards the cost of maintaining the library, if required. This included several respondents who do not use the library themselves but see it as an essential community resource. The majority of respondents stated that they would support an increase in Parish Council precept and many added that this should apply to all surrounding villages too. However a significant proportion stated that they pay enough council taxes already. Also 64% of respondents were willing to lobby councillors/the local MP to protect the future of the library. We raised £350 from the book sale so thanks very much if you took part. We also had a very interesting and well-attended talk from Helen Harwood entitled “The ties that bind us: a look at the village community past and present”. Two sheds in Hauxton Road, Little Shelford were broken into between November 13 and 14. A third shed in Garden Fields was broken into between November 20 and 21st. If you know a local charity or organisation that might benefit by receiving funds from the Sawston Fun Run, let us know. We are inviting local charities and organisations to apply to be a beneficiary of the event to be held on Sunday 13th May 2018. Each year, the event, donates around £15,000 to charities and organisations serving villages around Sawston. Since 1986 we have raised more than £440,000 for local hospitals, hospices, schools, youth groups, support groups and local branches of national charities. You need to identify a specific project or activity that needs support, tell us who will benefit, and say when the funds are needed. Whilst capital projects are preferred, the selection is based on the strength of each case. The closing date for applications is 30th November. Application forms are available off the website www.sawstonfunrun.co.uk or by contacting me by phone or email. Little Shelford Parish Council is exploring the possibility of changing the priorities for the Whittlesford Road/ Church Street/ Bridge Lane junction. The views of villagers were sought in the October 2017 newsletter. Feedback to the proposals can now be read on Little Shelford Online. The Little Shelford Playground Action Group were delighted to find out that they had secured a £38,000 grant from the Wren Community Action Fund towards the renovation of the new playground. This means that over £61,000 has now been raised with the help of fundraising events, donations and grants, and brings the project significantly closer to its target of £84,000. Further grant application results are due imminently, so it is hoped that work on the brand new playground will commence in the next 6 months. Susie Manning, Chair of the Action Group said: "Thank you so much for everyone who has contributed so far and attended the fundraising events! We are now in our last push and would love to get the project started in the next few months, so please if you were considering donating we are nearly there and any amount would be crucial in hitting our final target so we can get building! Many thanks from all the Playground Action Group". A new bus service linking Little Shelford with the Trumpington park and ride will be launched early in 2018. The service is about to go out to tender. It is expected to start early in 2018. Two new houses in Church Street have gone on the market. The Five bedroom houses are being marketed at £1.65m and £1.4m. They are being sold by Redmayne, Arnold and Harris. Changes are being considered for priorities for the Whittlesford Road/ Church Street/ Bridge Lane junction after a cyclist was seriously injured there in the summer. But villagers views and comments are needed first. The priority route is Bridge Lane – Whittlesford Road which is a very tight 90 degree corner. Most of the traffic from Bridge Lane turns right onto Church Street. Most of the traffic from Church Street turns left onto Bridge Lane. When making the right turn from Bridge Lane to Church Street, the visibility of traffic coming from Whittlesford Road is very poor. This is partly due to the low level wall of the garden of the house on the corner on the left of the road as one make the turn to the right. Locals know of the need to pull unusually far forward to be able to see to their left along Whittlesford Road before making the right turn. Some other drivers do not. The junction is clearly very dangerous. The Parish Council is considering whether to ask for the priorities to change, with traffic travelling towards Great Shelford on the Whittlesford Road being forced to give way instead of the current arrangement. That would mean that traffic from Church Street would be able to continue into Bridge Lane and vice versa without having to stop. Email your comments and views about the proposed changes to littleshelfordparishclerk@aol.com by October 15. A villager's car was written off after it was hit by a commuter's car in Newton Road. The victim has written to the Parish Council asking for traffic calming measures to be introduced. The Council is about to introduce speed cameras at the main entrances to the village. This will provide evidence to see if traffic calming or other measures are needed. The wooden gates at the entrances to the village are to be painted white to encourage cars to slow down as they drive into Little Shelford. The Parish Council has asked for our road gutters to be cleaned - some have plants up to 50cms high growing in them. South Cambs Council is getting rid of the blue bin paper caddy bins by the end of the year to save money - paper will be put into the blue bin itself. The Wale Recreation Ground is to be rolled regularly to try to deter further damage by crows seeking chaffer grubs. Thousands of pounds have been taken in a burglary at Winners Chinese takeaway. Winners was burgled after the takeaway closed between September 13 and 14. Anyone who saw anything suspicious around this time is asked to contact the police. More and more people are signing up for their street's Neighbourhood Watch scheme following the news that there has been 16 break ins in Little Shelford in the last year. In Whittlesford Road and Church Street, 35 households have signed up. There are also schemes in Courtyards and the High Street. Two cars have been broken into in Little Shelford. In the first incident in Church Street, the driver's window was smashed and a laptop taken. The theft happened between 7.30pm and 9pm on September 8. In the second incident, a car parked on the Recreation Ground for the Village dinner dance was broken into and a handbag taken. That theft happened between 6.30pm and 9.30pm on September 8. There was an unsuccessful attempt to break into another car on the Rec on the same evening. A book about Little Shelford is now available. ‘a snapshot in time’ is a 45 page book about our village has been produced by the Pavilion Art group. There are a few copies left costing £20. Please contact Sue Fox 842936 orAllen Boothroyd 843313 if you would like a copy. There will be no need for Little Shelford residents to use paper caddies from mid-December, in a move to simplify the recycling process. From 11 December 2017, residents should place used paper directly into their blue wheelie bins for recycling. The withdrawal of caddies also means fewer waste collection vehicles will in future be needed, helping save taxpayers around £670,000 during the next seven years compared to the existing system. Trucks will cover around 26,000 fewer miles per year on South Cambridgeshire’s roads than the current arrangement. After 11 December, residents can keep their caddies and use them however they wish. Alternatively, they can be taken to a household waste recycling centre for recycling. They should not be placed into wheelie bins. A new town development of 5,000 homes close to Great Chesterford threatens to put even more pressure on the A1301 through Great Shelford and Stapleford as well as local rail services to London. The new development is predicated on most of the residents taking up new jobs being created in and around Cambridge. The development is being proposed without any improvements in infrastructure, especially the A1301. The deadline for comments on the development is 4 September. This Summer SSYI (Shelfords & Stapleford Youth Initiative) and Romsey Mill took 12 young people from the Shelfords, Stapleford and Sawston areas on a residential activities trip to Cumbria. Led by youth workers Ollie, Zac and Tina they all took part in a week of Ghyll Scrambling, Kayaking, Climbing, Mining and many other adventurous activities, as well as lending a hand in the cooking and cleaning during the week. The trip was designed to encourage resilience, communication and self-efficacy skills and the outcomes of this residential have been hugely rewarding. We reviewed their ‘distance travelled’ and 100% of the young people explained they had increased confidence and more hope for the future. All the young people enjoyed themselves rating the trip a of 9.3 out of 10 on average! One young person said that the residential was “the best one ever” and he has “overcome my fears because of these people for encouraging me”. The young people boldly squeezed themselves through a lead mine, slid down a chilly river, and spent most of their time kayaking pushing each other in the lake (including the instructor)! The residential wouldn’t have been possible without the generous support of many of the local parishes, churches, charities and regular givers to both SSYI and Romsey Mill. We would like to say a huge thank you to you all. For more information about both charities, to support our work or to see the full report contact Ollie O’Meakin on ollie.omeakin@romseymill.org or visit www.ssyi.club or www.romseymill.org. Proposals to increase protection for Camping Close in Little Shelford have fallen on deaf ears. Camping Close is unlikely to be developed. But the Parish Council wanted to maximise protection for the area just in case any plans emerged in the future. The Parish Council wanted to see Camping Close be designated “Local Green Space” which would give it the same protection as being Green Belt. South Cambridgeshire Council endorsed the proposals. But now a Government inspector has said that while Camping Close was recognised to have local value ‘beauty’, ‘historical significance’, ‘recreational value’ and ‘tranquillity’, it was not considered demonstrably special and of particular local significance to warrant the Local Green Space designation. Whilst the Government report recommends the site is no longer identified as Local Green Space, it does recommend it should be a ‘Protected Village Amenity Area (PVAA)’. Whilst the not such a high level of protection as Local Green Space, PVAA does ensure the value of a site to the village is recognised. “Little Shelford is one of the most beautiful villages in Cambridgeshire and Camping Close is a critical part of that beauty,” said Parish Council Chairman David Martin. “This change is a real shame for the village. It is also frustrating that the Parish Council was not consulted about the final proposal”. Great Shelford library is facing an uncertain future according to the Friends of the Library. The group has has decided to seek the views of those who currently use the library and also those that don't use the library about how the committee can respond to future changes. Surveys can also be found at the library itself. The surveys need to be completed by September 16. A number of changes are taking place at Little Shelford's pub, the Navigator. The Navigator is now open seven days a week lunchtimes and evenings serving Thai food. The pub now has a new manager - Barry Smith. He has lots of experience with real ale and Thai food he was previously a manager at the Three Tons in Abington for four years. There are a handful of tickets left the village's 80’s Dinner Dance on Friday 8th September. Come along for dinner from Shelford Deli, dancing to live music from “Back to the 80’s”, fully licensed bar and charity auction with fabulous lighting by Simon Mackinder. Also, “80’s” fancy dress competition. For tickets e-mail Liz Carrothers (lizcarrothers@icloud.com) or call on 07808 128037. Tickets £35 per person payable in advance. A new storage shed has been installed at the rear of the Sports Pavilion on the Wale Recreation Ground. The shed will be used by the cricket nd football clubs. It will mean that the unsightly container on the rec will soon be removed. Thanks to Ray Saich for organising the new shed and neil Orpwood and the Cricket Club for laying out the foundations. A Neighbourhood Watch network for Little Shelford is now expected to be in place by the end of the summer. The move follows the news that there were 14 break-ins in Little Shelford in the year April 2016 to March 2017. That included three house burglaries. Fiona James in Whittlesford Road and Julie Darsley in Courtyards along with Diana Haines in Church Street have already been doing their best to keep their neighbours updated on crimes in their area. Now the Parish Council wants Neighbourhood Watch schemes in every street in the village so information about crimes in Little Shelford is shared with everyone who wants it. This means that people who opt-in for the email alerts will be informed if there have been any incidents in the village. A number of people in Little Shelford have already come forward to volunteer as Neighbourhood Watch Co-ordinators. They will be dropping letters through people’s letterboxes through the summer asking to join the Neighbourhood Watch schemes in their street. Villagers will only receive the information if they request it. Junction of Hauxton Road and Newton Road Several holes. Bridge Lane opposite entrance to 6 Bridge Lane 3 holes. Whittlesford Road opposite first (yellow) house called the Lodge. Cheques totalling £2,750 were given out at the Annual Village Meeting in May. The money has been raised through our Fun Week-end activities. Does your child enjoy listening to stories? Come along to the library with your child at 11am for half an hour on Tuesday mornings throughout August starting on August 1st. The stories will suit 3-7 year olds. A parent/ carer will need to stay with their child. There is no charge and no booking is required. Look out for posters around the village. Organised by the Friends of the Library. There has been at attempted burglary in the High Street in May. "I have recently had an incident at my home where I woke in the middle of the night and found lights and front door wide open," said the householder. "Luckily nothing taken. Police have put it down as an attempted burglary." The householder is now planning to speak with someone to discuss a Neighbourhood Watch for the area and talk about extra security. The Council has agreed to give another £5,000 to the playground campaign -if the group is successful in winning other major grants. Mary Palazzo has resigned from Council after 5 years - the council is now looking for a new Parish Councillor. There have been 14 burglaries in Little Shelford in the last year. Parish Council Chairman David Martin told the Annual Village Meeting that they are so concerned that they will be campaigning to create Neighbourhood Watch schemes in every street this year. A 40mph speed limit has been introduced between Little Shelford and Hauxton, which will help to reduce the speed of traffic entering the village on Hauxton Road. David Jones organised a village spring clean on behalf of the Parish Council in March. And the possibility of setting up a warden scheme for older people in Little Shelford. You can read David Martin's full speech here. 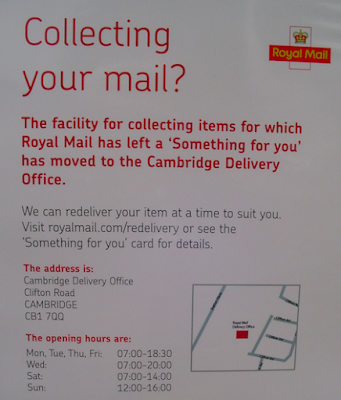 Royal Mail will no longer leave undelivered large items of mail at the new Post Office at the Kash Stores in Hinton Way it has emerged. The Post Office says there is insufficient storage at the Post Office/Kash Stores. (See the notice, left). Little Shelford has two new county councillors after the elections on May 4. Conservatives Roger Hickford, who lives in Little Shelford and Kevin Cuffley were elected. Roger is the Deputy Leader of the County Council. Previous sitting councillors Tony Orgee and Gail Kenney both retired. The village falls in a new constituency called Sawston and Shelfords. A bizarre case of vandalism in Little Shelford being investigated by Cambridgeshire Police has been solved. In April, Police issued a statement: "Between the dates of 21/04/17 at 17:00 and 22/04/2017 14:00 in Beech Close, Little Shelford. "Unknown offender has entered garden of aggrieved's property and 'deadheaded' number of plants and flowers with malicious intent." They even gave it a crime number - CF022060417. Now we can unmask the "unknown offender" behind the malicious intent- a Muntjac deer! "This happens all the time in Beech Close," said one resident. "It gave us a laugh when we read about the Police appeal." We are now waiting to see if the deer is going to be apprehended. After this story was first published on Little Shelford Online, it went on to appear in the Cambridge News and The Sun. A special All saints Church Celebration took place on April 20. The photo shows (left to right\) The Bishop of Ely, Stephen Conway, Simon Scott, Current Rector, Christopher Ash, Rector who lead the Church Growth initiative 20 years ago and The Bishop of Maidstone, Rod Thomas and also a very large cake that we used to celebrate the occasion along with the supper in the Village Hall and a service in All Saints. Robin Church said there were about 36 Church members before the growth initiative and there are now over 150 so its seems to have worked, (with a third living in the Village). The Easter bank holidays mean that the bin collection days in Little Shelford are changing temporarily. Collection days will then revert to Tuesday. Full details here. A car wheel has been stolen in a bizarre theft. A Beech Close resident was working on his car on April 10. He had taken off a front wheel, went inside, looked out of his landing window and saw a white van slowly driving round the Close. The van stopped outside his driveway, a man got out came onto his property and stole his wheel befor the resident could get downstairs. The council is keen to have a warden scheme for older people in the village. Read the full details of the meeting here. Jewellery was stolen when a house on Whittlesford Road was burgled between 1.30pm and 4.30pm on March 12. At least five out buildings or garages have also been broken into in Little Shelford using bolt cutters. Three of the break-ins took place in Beech Close between March 5 and 6. The The thieves broke through the back fence from the High Street. Two further break-ins happened in in High Street. Burglars entered two sheds, stealing tool boxes of carpentry and wood turning tools, plus an outboard motor. Police say that the burglars were well equipped with a patrolling hire van collecting the stuff from the on foot thieves. They were also wearing gloves. * Sometime between February 11th and 15th a house has been broken into in Hauxton Road, Little Shelford. The burglars first broke into a shed and used tools from there to gain entry before jewellery was stolen. The new Post Office at the Kash Stores in Hinton Way opened on Tuesday 7th March. Opening hours 0700 till 19.00 Mon to Sat and 07.00 till 13.00 Sunday. It was then officially opened by MP Heidi Allen (pictured with owners Jayshri and Kash) and March 24. For those residents living in Little Shelford who don't have transport or have difficulty with mobility, the Whippet No 31 bus service runs four journeys per day Monday to Saturday that are convenient for the Post Office. More than 10 sacks of rubbish were collected by villagers and parish councillors in a special spring clean on March 12 organised by David Jones. The most unusual find was 6 pairs of shoes. There was a van fire at the junction of Newton Road and Hauxton Road on February 24. Photos by Allen Boothroyd and Pamela Stewart. Kate Beaton, Jo Boyle, Liz Carrothers , Mel Chaplin, Chris Christodoulou , Diana Haines, Steve Henry, David Jones, Brie Lury, David Munro, Gail Pilkington, Andy Stephenson. Sadly Steve Henry is retiring from the committee (he had to move out of the village to achieve this) and Rosie Ferrandino is kindly joining. And finally, to all those who came along and had fun over the course of the weekend! We are always looking for extra pairs of hands to help, especially: handymen who can move/set up/take down staging and heavy equipment, those with catering experience to help on the Friday evening, and people with offers of auction prizes. If you can help, we would love to hear from you. The weekend can’t function without the village supporting it. I look forward to seeing as many of you as possible at the 2017 fun weekend, 8-10 September. The Parish Council’s spending from April will rise to almost £31,000. That will mean a 1% increase in the village’s share of our council tax bills. The rise will pay for a survey of trees in Little Shelford and a new mobile speed sign. Volunteers are wanted for a special tidy Little Shelford day on March 12th at 2pm. The Parish Council is also organising session at the Memorial Hall on the same day at 5.30pm where villagers can meet their Parish Councillors and also find out about different groups and societies in Little Shelford. The Parish Council is paying £700 for a new pedestrian gate at the Wale Recreation Ground. A house at 42 High Street is to be demolished, to be replaced with two six-bedroom homes. There are several spare allotments in Garden Fields which are available for rent. Read the full details of the January Parish Council meeting here.